Elli was so weak the first time I saw her that she had great trouble getting up and could hardly stand, but she jumped right into my heart. We found out about her just in time. An animal control officer in another town had found an old blind, deaf, and emaciated dog near death, infested with fleas and tangled up in a briar patch. A friend contacted us about her, hoping Elli could find a home rather than face euthanization. 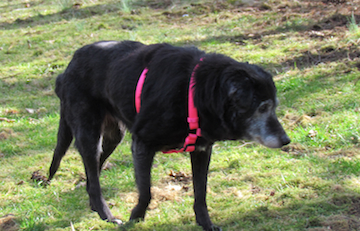 A sweet and wonderful dog, she faced more than her share of problems: arthritis, Lyme disease, ear infections, low thyroid, lymphoma, anemia, and a urinary infection. We named her Elli, after the seemingly frail and fragile old woman in Norse mythology, the goddess of old age, who was so strong that she defeated Thor in a wrestling match. In the year that she was in our home, she became so dear a part of all of our lives, showing warmth toward all and such joy in life. Elli was a wonderful member of our family, brought us great joy, and we miss her terribly. Please follow this link to the other special-needs dogs and cats who live as a family in our home.